A Syrian-born German jihadist linked to the 11 September 2001 attackers has reportedly been detained by Kurdish fighters in northern Syria. A commander of the US-backed Syrian Democratic Forces alliance told the AFP news agency that Mohammed Haydar Zammar was in custody and being questioned. The commander did not say whether Zammar was suspected of fighting for the Islamic State group (IS). The US-led global coalition against IS said it could not confirm the report. The SDF has detained hundreds of foreign IS militants as it drives the jihadist group from tens of thousands of kilometres of northern and eastern Syria. The arrested militants are reportedly being held at camps near Raqqa, a city that served as the de facto capital of the IS "caliphate" until it fell to the SDF in October. Zammar's detention was first reported on Tuesday by the German newspaper, Bild. The newspaper cited Kurdish sources as saying he was in a prison run by the Kurdish People's Protection Units (YPG) militia, which dominates the SDF. Zammar moved from Syria to Germany in 1971. By the late 1990s, he was a prominent Islamist in the German city of Hamburg. He is reported to have encouraged the lead 9/11 hijacker Mohamed Atta and other members of the "Hamburg cell" to participate in violent jihad, and convinced them to go to Afghanistan to attend an al-Qaeda training camp, according to the 9/11 Commission Report. There is no indication however that Zammar was aware of the plot to attack the US. The German authorities investigated Zammar after 9/11 on suspicion that he had "supported a terrorist organisation", but he was released and left the country. In December 2001, he was seized in Morocco and transferred to Syria, apparently as part of the US Central Intelligence Agency's so-called "extraordinary rendition" programme. He handed over to Syrian intelligence agents, who allegedly tortured him in detention. The agents are reported to have allowed their US and German counterparts to provide a list of questions to ask him and passed on the answers. In 2007, a Syrian court sentenced Zammar to 12 years in prison for four offences, including membership of the outlawed Syrian Muslim Brotherhood organisation. Six years later, after Syria had descended into civil war, he was released as part of a prisoner exchange between the Syrian government and the hardline Islamist rebel group, Ahrar al-Sham. 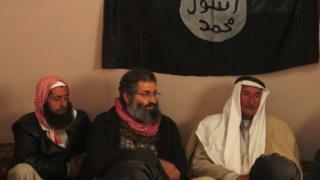 It is not clear what happened to Zammar afterwards, but in early 2014 he was pictured attending a meeting between IS militants and Syrian tribal leaders. One unconfirmed report from late 2014 said he was sent to Egypt by IS leader Abu Bakr al-Baghdadi to persuade a jihadist group operating in the Sinai peninsula to swear allegiance to Baghdadi.